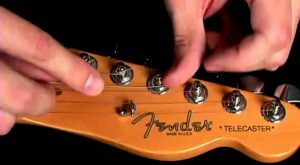 How to String a Guitar: Step by Step – Sound Check Lab. For guitarists, having an idea of how to string a guitar is very important. So to all guitarists out there who don’t know how to do it, this post is for you. 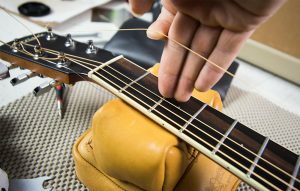 Below is a detailed step-by-step guide showing how to string a guitar correctly. Loosen the strings off by unwinding them. You can do this by hand or using a string winder. When the strings are loose and nice you have to snap the bridge pins out of their own holes. However, doing this is fairly easy as the tension is already off the guitar’s strings, in fact, you can simply make use of your hands. But, if you cannot get them by hand you can use a needle nose plier or wire cutter to remove the pins. Then drag the strings out of the bridge’s holes. Return to the headstock and finish unrolling the strings of the guitar head and then pull the string’s end over the hole. To begin with, place the bridge pins in their slots loosely as this will come in handy when you are placing the strings. Place the Low E string’s ball-end to the hole in the bridge in which the Low E must go. Then change the bridge pin. Typically, the bridge pin has a positioned trench in which the string be seated. However, before pressing the pin make certain that the string is sitting so as to that the ball-end’s hole is facing outwards instead of upwards. Remove any slack by pressing and holding the spin and pulling the string upward. For the rest of your guitar strings, simply repeat the procedure. Arrange the guitar heads so that holes in which the string will go over is facing downward the guitar to its neck. Put your string over the hole. Then hold the guitar string outside the neck using your thumb in order to let for loose. Next, wrap your string around the machine head’s inside to the right. Then loop it underneath the string which is coming from the nut. Using your right hand, keep tightness on the string and tightly drag the strings against the head using your right hand. Then wrap back the string through the way you just approached from and wind towards the head stock’s topmost. 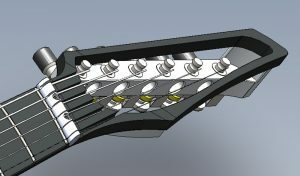 To ensure that it is holding tight, drag the ends (both) of the string around the headstock. This must lock the guitar string in position so that when you pull it on from below the head it shouldn’t be unraveled and tight. 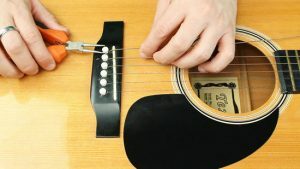 Using your right hand, hold your guitar’s string and then place the string thus it will sit in the right hole in the nut. Don’t forget to keep some tension on the string using your right hand. Hold it in position in the nut trench then begin to wind the tuning peg. For treble strings make sure to wind them clockwise, whereas bass strings should be winded counterclockwise. When you’re winding, make sure the string winds nearby the machine head from topmost to bottommost and that it does not overlay on itself. At this point, you’ll be winding them so that they’re tort enough in order to hold themselves in position. 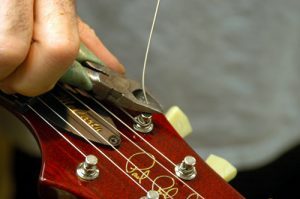 When clipping the strings make sure that you’re holding the string’s ends using the hand that is not cutting to ensure that the string will not drive flying off. Further, clip the strings as close to the machine head as possible so that there is not much sagging out which you may possibly scratch yourself on. Once you’re done clipping the strings make sure to tune your guitar. Don’t worry there are also lots of tutorials on the Internet that you can use as your guide. Doing this is pretty easy. All you have to do is take the string just overhead the sound slot and then pull it upwards. Afterward, retune your string and then repeat the process. Make sure to do this two to three times on every string. There you have it our detailed step-by-step guide on how to string a guitar.